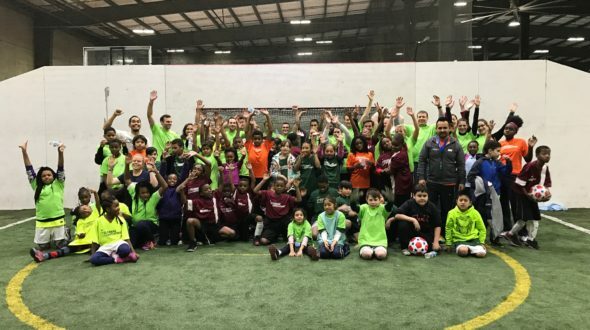 One of UI’s most committed supporters, Stock candy company, helped celebrate another amazing Work to Play season by hosting the annual Storck-Urban Initiatives Game Day at Chicago Indoor Sports last Wednesday. Their group of 20 volunteers coached our kids on the field, distributed special edition Storck Game Day t-shirts, and served a deliciously healthy post-game dinner for UI kids and families. Upon arriving at the Indoor Center, teams from Jenner, Lawndale, and Otis were given their very own lime green Storck jersey. After the teams, volunteers, and Team Captains were split up, we were ready to play! As some volunteers chose to help manage fields and cheer from the sidelines, others dusted off their soccer skills and joined in on a more competitive Storck vs Team Captain scrimmage. Following the series of soccer scrimmages, the kids and families were treated to a healthy and delicious spread of veggie and black bean burgers, veggies, and fresh fruit. The turkey burgers were a healthy alternative for our players, and for many of them, their first experience trying one. The veggie tray was also a surprisingly big hit. Lyric, a 2nd grader from Jenner, went back multiple times for more cucumbers. She also left with a plate full of carrots and red peppers! One of the most special moments from the day came right before Team Jenner was about to head back on the bus. Storck volunteers came together and wished 5th grade Sariyah a very happy birthday with a Storck rendition of Happy Birthday. After each team was dismissed, volunteers ended Game Day by taking advantage of the last 30 minutes of field time by playing in a volunteer scrimmage. It was truly a perfect way to end a fun-filled afternoon of soccer and friendship. Team Storck truly upheld their company’s motto, “Storck: Part of your world.” We cannot thank Storck enough for being such a positive part of the UI family, and for the impact you have on our community and kids. Thank you!